No special treat today at the White House for a president, who has grossly violated his country’s Constitution, and shown that he cannot be trusted either by the people of Sierra Leone or the White House. 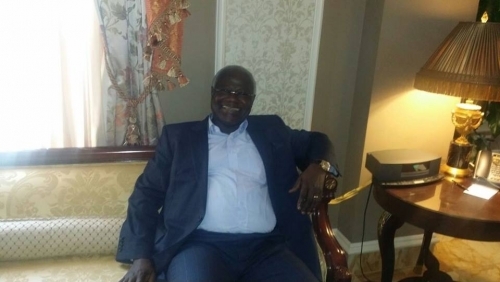 (Photo: President Koroma happily relaxing last night at his luxurious hotel bedroom in Washington, whilst his people are dying of Ebola and poverty in Sierra Leone). According to sources, after last minute diplomatic shuffling by the UN, the World Bank and the IMF, president Obama finally agreed to meet with president Koroma, but only in the presence of presidents Sirleaf and Conde of Liberia and Guinea. This last minute decision has saved a lot of embarrassment for the people of Sierra Leone, who really deserve better leadership to that which they currently endure. This photo taken today at the White House (Photo: Below), tells a million stories. But the most important of all, is the unprecedented decision of president Obama to keep Koroma at a far distance, in sharp contrast with previous visits, when Koroma would be seen sitting right next to Obama. How times have changed. Today, President Obama did not single out Koroma for any of his previous adulation. Koroma has singlehandedly destroyed that level of respect and admiration Obama had showered on him years gone by. 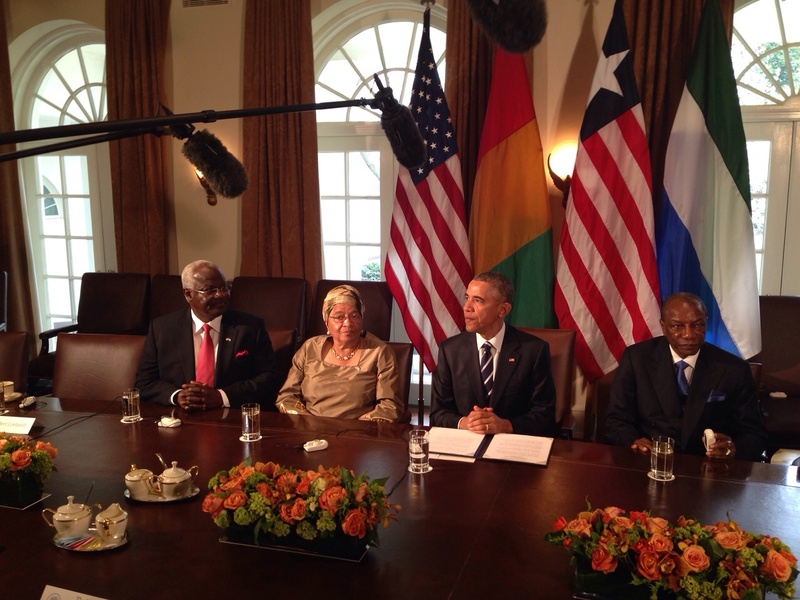 President Sirleaf is now Obama’s rising star in Africa. Previous visits to the White House by African leaders are usually very well publicised in advance. But today’s visit was low-keyed, with no opportunity for the media to ask questions, which could have embarrassed both Obama and Koroma. Instead, the American president gave a short statement to the press, about the purpose of the visit by the three West African presidents. Well, I want to welcome Presidents Sirleaf, Koroma and Condé. The United States has a long partnership with Liberia and Sierra Leone and Guinea — partnerships that prove to be critical in the fight against Ebola. We’re here to assess progress today and to look ahead. We begin by noting the incredible losses that took place in all three countries. More than 10,000 people have died from Ebola — men, women and children. On behalf of the American people, we want to express our deepest condolences to the families and recognize how challenging this has been for all the countries involved. Under extraordinary circumstances, the people of these three countries have shown great courage and resolve, treating and taking care of each other, especially children and orphans. The United States has been proud to lead an international effort to work with these three countries in a global response. Last week, there were fewer than 40 new cases, so we’ve seen major progress. In Liberia right now, there are zero cases. In Sierra Leone and Guinea combined, there were fewer than 40 new cases last week and that’s around the lowest number in a year. Now we’re focused on a shared goal, and that is getting to zero. We can’t be complacent. This virus is unpredictable. We have to be vigilant, and the international community has to remain fully engaged in a partnership with these three countries until there are no cases of Ebola in these countries. Health systems also have to be rebuilt to meet daily needs — vaccines for measles, delivering babies safely, treating HIV/AIDS and malaria. And with our Global Health Security Agenda, we intend to do more to prevent future epidemics. So the Ebola epidemic has been also an economic crisis. That’s part of the reason why these three presidents are here. They’re going to be meeting with a number of the multilateral institutions — the IMF and World Bank here in Washington. There’s the challenge of restoring markets and agricultural growth, promoting investment and development. So I’m going to be looking forward to hearing from them on how the United States can stand shoulder to shoulder with them to work hard to take this crisis and turn it into an opportunity to rebuild even stronger than before: To strengthen administrative systems, public health systems, to continue the work that they’ve done in rooting out corruption, reinforcing democratic institutions — all of which will be the foundation stones for long-term progress and prosperity. So Madam President, Mr. Presidents, we are very grateful for the hard work that you’ve done. We’re proud to partner with you and we intend to see this through until the job is done. Thank you, everybody. 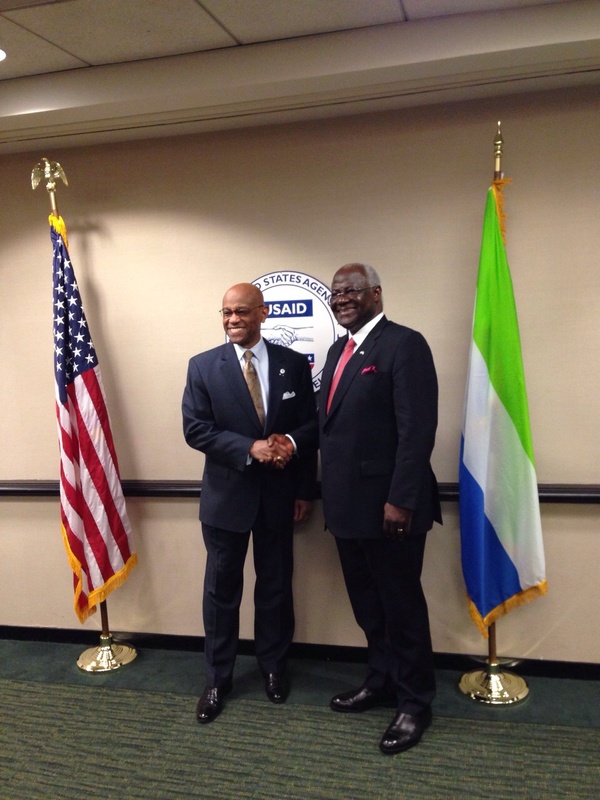 Following the meeting at the White House, president Koroma was whisked off to visit the American international aid agency – USAID, to discuss America’s continuing support for Sierra Leone. (Photo: Below). President Koroma’s government has persistently failed to convince the American government that it has the credibility and capability to manage large scale donor funds, consistent with the strict terms and conditions, which must be met before any nation can qualify for US millennium compact. With massive corruption in high places in Sierra Leone, added to the latest saga involving the disappearance of more than $14 million meant for caring for Ebola victims, it is unlikely that the international community would regain the trust that has been destroyed by the Koroma government in the last few months. On Friday, 17 April, World Bank Group President Jim Yong Kim will chair a high-level roundtable, during which, the presidents of Guinea, Liberia and Sierra Leone will share their Ebola recovery plans with finance and development ministers and international partners. The event will focus on building global support for the three Ebola-affected countries to get to and sustain zero cases, jumpstart recovery, and build more resilient health systems and economies. Some of the participants will include: Alpha Condé, President, Guinea; Ellen Johnson Sirleaf, President, Liberia; Ernest Bai Koroma, President, Sierra Leone; Jim Yong Kim, President, World Bank Group; Ban Ki-moon, Secretary-General, United Nations; and Christine Lagarde, Managing Director, IMF. Following this high-level roundtable, the World Bank, along with USAID and the World Health Organization, will host a day-long meeting with government leaders, donors, multilateral organizations and civil society to discuss Ebola recovery and the strengthening and rebuilding of health systems in Guinea, Liberia and Sierra Leone. I couldn’t help but wonder if President Obama wanted to take a minute to remind EBK about the importance of respecting democracy. Even if Ebola ends tomorrow, will investors be drawn to the country in this current political climate. I am not certain that President Obama would have wanted to waste any further time with President Koroma. It is evident that Obama had to tolerate Koroma at this meeting, because it would have been diplomatically unacceptable not to meeting with President Sirleaf and Conde, because of any frustration or disappointment with Koroma. Nonetheless – the APC would hawk this as a diplomatic success for a beleaguered president. What is more important is not just that President Koroma and other corrupt politicians in Sierra Leone and elsewhere are given the cold shoulder. International organisations and governments should provide all necessary support to ensure that these leaders face justice, including the full recovery of all stolen assets – as is the case with the former president of Nigeria, Sani Abacha.